ThirtyFifty has a team of wine experts based around the UK running private parties, corporate events and wine courses. We are happy to travel to most UK mainland places including all of southern Scotland down to the top half of the South West and all points in between. 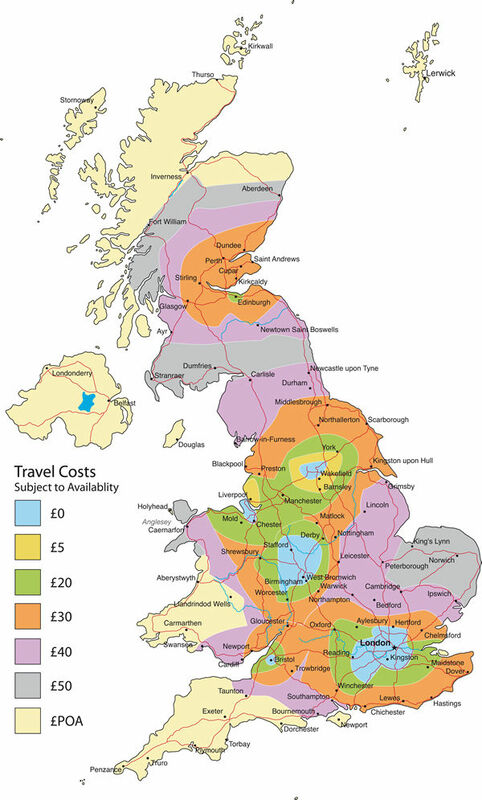 The bottom of the page shows a map giving a rough idea of any travel costs, this is only a guide and subject to availability. Below is a list of regions giving a quick overview of our coverage and the types of tastings available. There are links to the towns and counties which we get the most requests for and are able to travel to. If the area you are looking for is not mentioned please call us and we can let you know if we can come to you. We cover all of the South East with our team evenly spread across the region so that we can cover from Dover to Oxford with ease! Below are some of the popular counties and towns in the South East. We have added some useful information to answer questions that we are most often asked. In the South East we regularly run wine tastings on Wednesday evenings and Saturdays in London and a couple of times a year on a Saturday at Great Missenden Abbey in Buckinghamshire. Bristol is one of the top cities for wine tasting and in addition to our private parties and corporate events we regularly run wine courses that you can attend or give as a gift. We often host wine tastings at cottages and private houses in the South West with the Cotswolds being a popular destination. With a number of our team living in the South West we are able to cover most of the region. For Devon and Cornwall travel costs are higher which means tastings here may only be viable for large groups of 20 people or more. Below is additional information for various counties and towns in the South West that people have requested previously. We often run wine tastings in East Anglia, or the East of England, as it is offically known. We have one of our team covering the region based in Hertfordshire, and for Norfolk and Cambridgeshire we often bring a member of our team over from the East Midlands, while Essex and Suffolk can be covered by our team in Kent or London. Travel into London by train makes our London wine courses on Saturdays easy to reach via the Thameslink, even if are coming from further afield. Essex, Suffolk, Hertfordshire, Bedfordshire, Cambridgeshire and Norfolk. We run a full range of tastings in the West Midlands and cover all areas. Some of our team of wine tasters are based in the Midlands and other members are within easy reach of the region's cities such as Birmingham, Stoke and Hereford, as well as popular counties such as Staffordshire. In addition we also run our great value wine tasting weekend breaks in conjunction with Britannia Hotels at Market Bosworth in Warwickshire. We cover Derbyshire, Nottinghamshire, Leicestershire, Rutland, Northamptonshire and most of Lincolnshire. We cover Leeds, Yorkshire, Harrogate, Humberside and northern Lincolnshire. We are within easy reach of Liverpool, Cumbria, Lancashire, Manchester, Merseyside and Cheshire. We cover most of southern Scotland especially around Glasgow, Edinburgh and can travel to Aberdeen. We are more than happy to consider further afield but the travel costs may be higher. We cover most of north Wales and in and around Cardiff. We are more than happy to consider further afield but the travel costs may be higher.